Stretching along more than 1.5 miles, Baker Street runs from Marylebone to Oxford Street, and is one of the main arteries in this area of London. 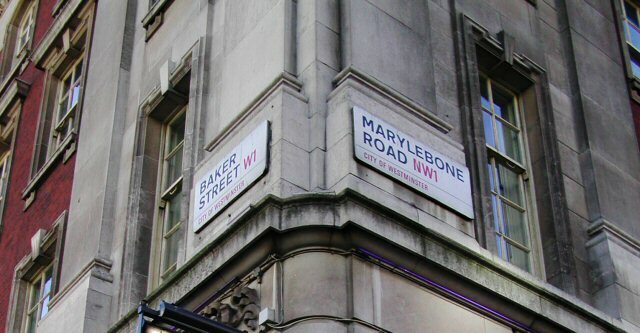 Like other neighbouring streets, Baker Street was first laid out under its current name during the eighteenth century. The street received its name from the builder who laid it out. In the beginning, Baker Street was mostly a residential area for affluent families. However, as London grew in size, population, and economic importance, the street welcomed new tenants and transformed some of its residential buildings into office space and commercial premises. Perhaps the most well known building in Baker Street is number 221B, otherwise known as Sherlock Holmes’ residence. In fact, the address does not exist, although the Sherlock Holmes Museum is located on numbers 237-241. The Abbey House, home to the Abbey National Building Society between 1932 and 2005, and located on numbers 219-229 of Baker Street, received for many years correspondence addressed to Mr Sherlock Holmes. On a more modern note, 55 Baker Street is a striking piece of architecture that provides an interesting contrast with the surrounding buildings. Transport for London operates 14 bus lines that stop along Baker Street. Buses link Baker Street with Norwood, the Aldwych, Golders Green, Euston, Chalk Farm, Turnham Green, Hackney, Marble Arch, Putney, Finchley, Victoria, Edgware, Waterloo, Brent Cross, Hampstead, Oxford Circus, Bow, Paddington, Islington, and Deptford. Services to and from Chalk Farm, Waterloo, Hampstead, Brent Cross, Oxford Circus, Deptford, Bow, and Paddington operate round the clock. Regular coaches that link Oxford and London stop at the intersection of Marylebone Road and Baker Street. There are also minibuses that take passengers to Luton and Stansted airports. These depart from a pick-up point located between Baker Street and Gloucester Place. The history of Baker Street underground station can be traced back to 1863, when the station was opened as part of the Metropolitan line. A large part of the station’s built premises date from 1925. Nowadays, Baker Street station is still part of the Metropolitan line, although the station has been expanded to accommodate the Hammersmith & City, Bakerloo, and Jubilee lines. This means that visitors can reach Baker Street from places like Wembley, Oxford Circus, Willesden, Hampstead, Bond Street, Westminster, London Bridge, Greenwich, Stratford, and the business district at Canary Wharf. From Baker Street underground station visitors can also connect with National Rail services at Paddington, Charing Cross, and Waterloo. More than 26 million passengers use this station every year. 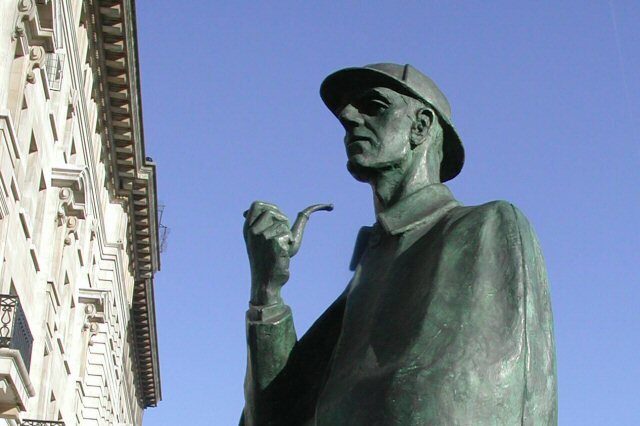 The Sherlock Holmes Museum lies at the top of Baker Street, near Regent’s Park. 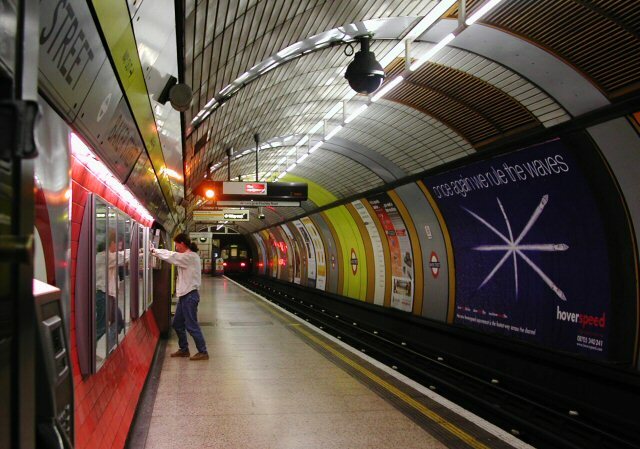 Baker Street underground station is just five minutes away on foot, before the street intersects with Marylebone Road. Between this point and George Street, the visitor will find a large number of restaurants, coffee shops, and high street banks. Further south, Baker Street turns into Portman Square and Orchard Street, before reaching the Selfridge’s building on Oxford Street. Baker Street Quarter – a not-for-profit company working towards becoming a Business Improvement District (BID) in spring 2013. Bistrot de Luxe – located at 66 Baker Street, Bistrot de Luxe offers top quality French cuisine at affordable prices. Office Space Marylebone & Baker Street – a wide selection of office suites in Baker Street area, ranging from affordable business accommodation to five star executive suites. Further guides on important streets in the city of London including Old Street, Broad Street, Goodge Street, Great Portland Street, Cannon Street and Regents Street. How on earth can there be a “”Sherlock Holmes Museum” when there was no such person in real life?